Ahh, November! Around here… whenever this time of year comes around, it means crisp fall weather, Santa Ana winds… and cold/flu season! :( Last week, I came down with a terrible cold. I was so incredibly miserable, and I found myself craving the Mexican chicken soup that we usually get at a local hole-in-the wall place. But you know how it is when you are sick – the LAST thing you feel like doing is driving down to a restaurant and being out in public while sniffling and sneezing (especially when you’d rather be at home on the couch with a cat on your lap). 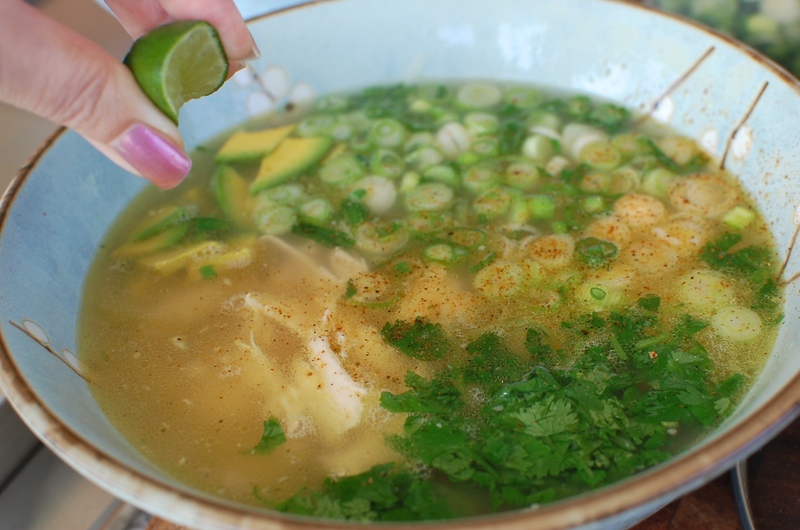 So of course, the next best thing was to make the Lourdes Mexican Chicken soup myself at home. Lourdes Mexican Restaurant (in Escondido, CA) is famous for their secret recipe “Mexican Chicken Soup”. Their soup has a rich and flavorful chicken broth, with high quality shredded chicken breast, rice, minced onions and cilantro – and a topping of sliced avocado… just the thing you need when you are feeling under the weather. If you are ever in the San Diego area… look them up and try it – you will not be disappointed! But if you can’t get down to San Diego… or if you are sick and not feeling up to driving to a restaurant… you can try my copycat version instead. Enjoy! P.S. Since it is November… I should mention that if you are looking for guidance on how to roast a Thanksgiving Turkey, I posted my recipe/method last year. Check out my brined Thanksgiving Turkey recipe if you are interested (I’ve also included my method for making gravy from the drippings). 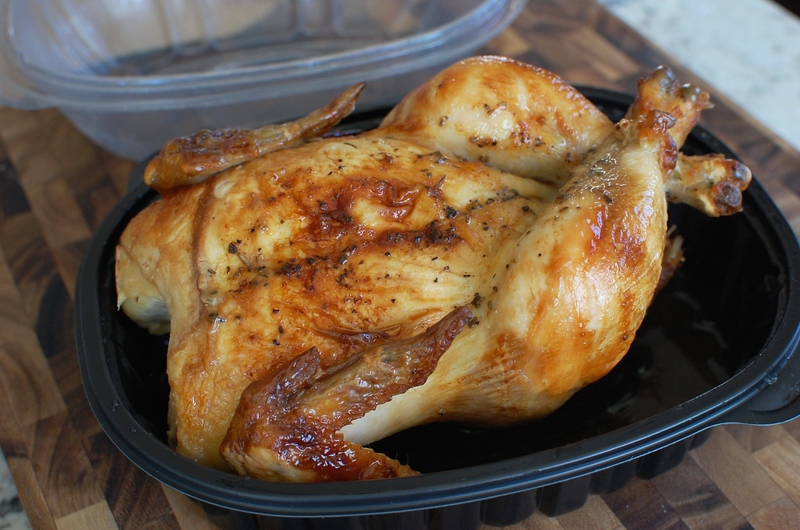 And don’t forget… if you bought a frozen bird, you will want to defrost it 1 day for every 4 pounds + an extra day (in the refrigerator). (I bought a 22 pound bird which I am going to start defrosting about 1 week beforehand – on the 20th of November next week.) If you are looking for Thanksgiving side dish ideas, one of my favorite Thanksgiving side dishes is my Sweet Potato Casserole - it has a brown sugar/pecan crust and is made from whole fresh yams (it can be prepared a day or two ahead of time). P.P.S. I apologize if anyone has noticed that this website has been down over the last week or so. We had some technical problems so have upgraded/updated the hosting server to fix the issues. Hopefully the website will work much faster and load more quickly from now on! 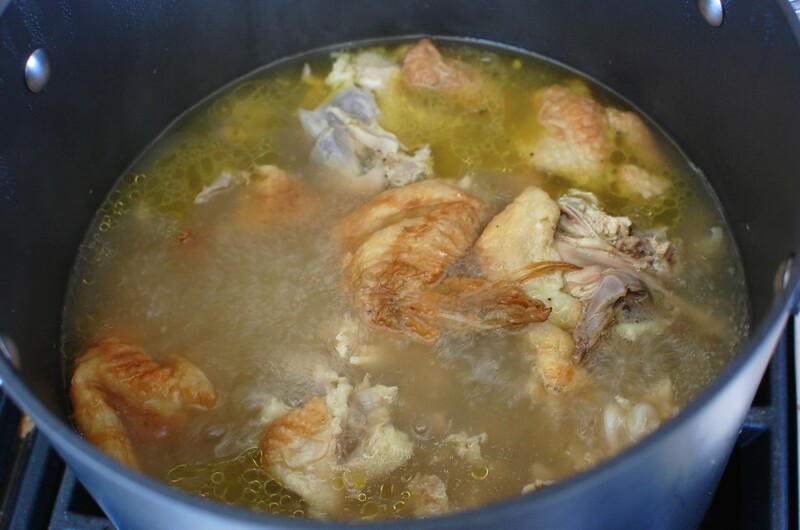 Use a cooked rotisserie chicken from the supermarket as the base for your chicken soup. 1. 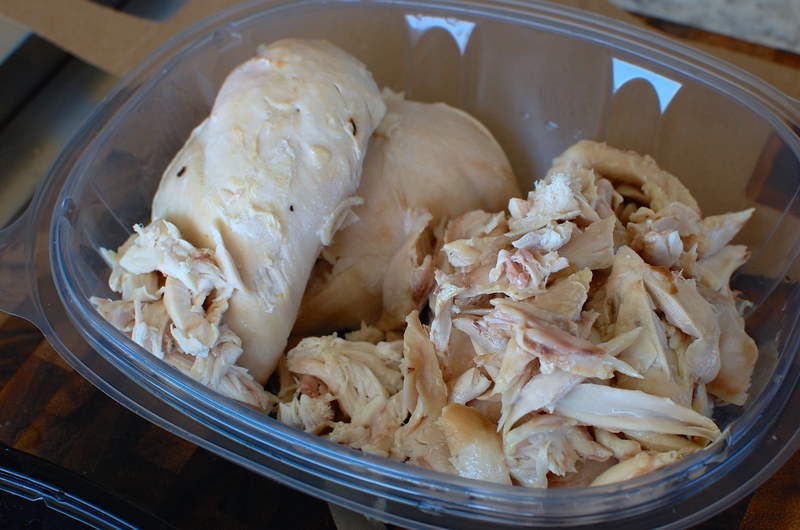 Remove the meat from a cooked rotisserie chicken. Set the meat aside for use in the soup later. 3. 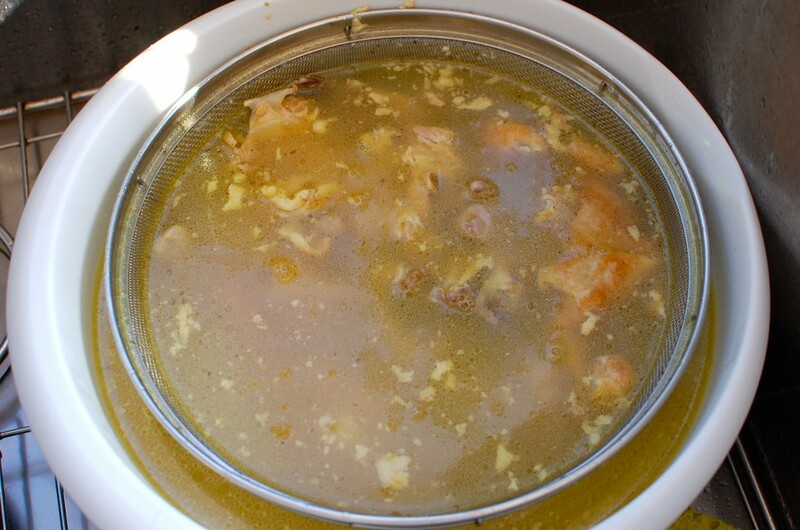 Add the two bouillon cubes (optional) and simmer the chicken carcass over medium low for 1-2 hours. 4. Remove from heat. 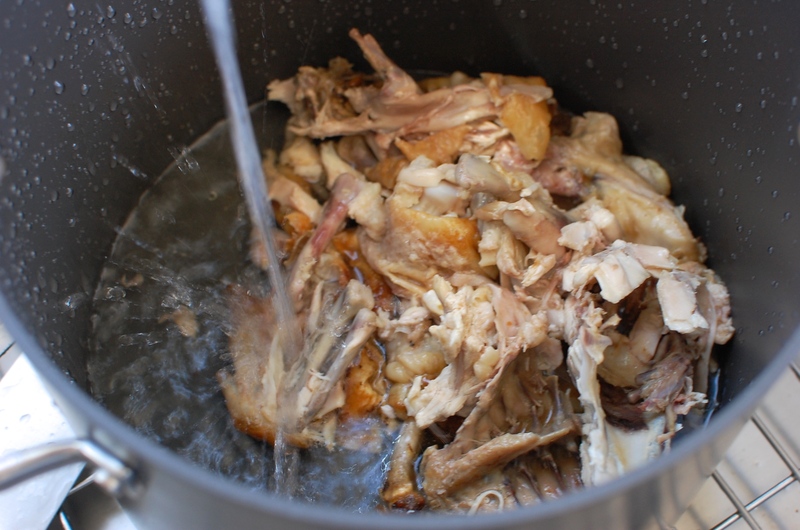 Discard the chicken carcass, and strain the broth into a clean stock pot or bowl. 5. 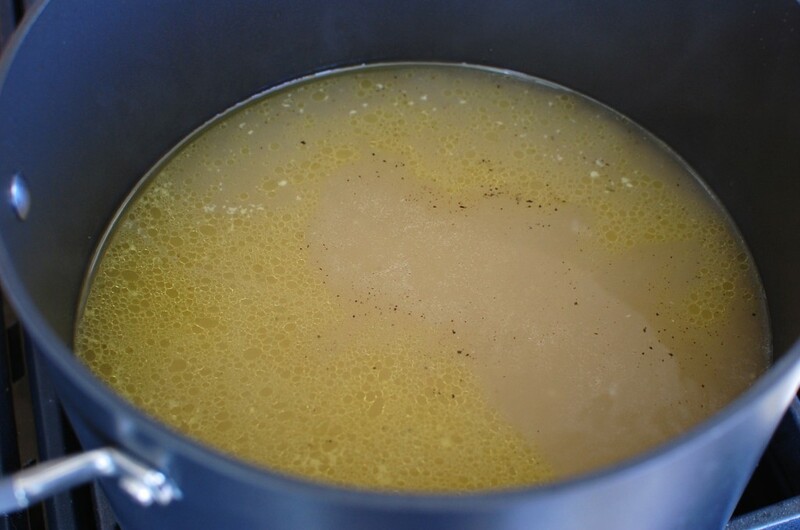 Heat the strained stock to a simmer, taste. Add salt/pepper if needed. 6. 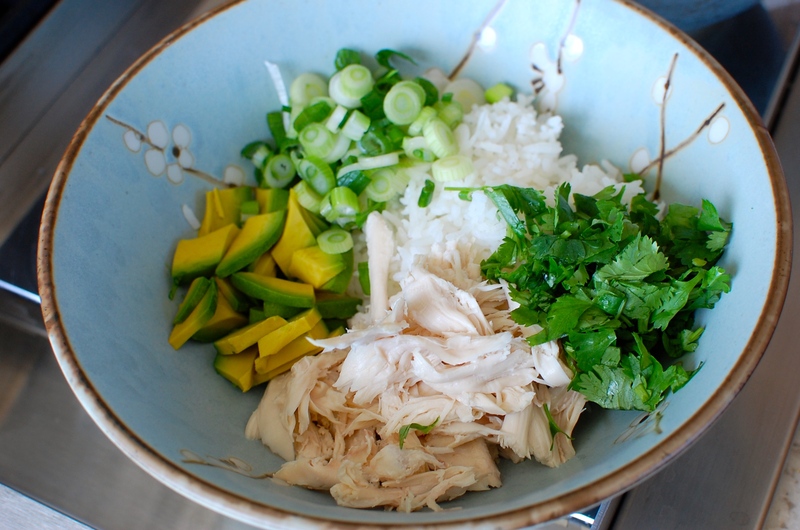 To serve, add a scoop of cooked rice into the bottom of the bowl, top with the reserved chicken meat, onion, cilantro, and avocado. 7. Ladle the hot broth into the soup bowl. Squeeze 1-2 lime wedges into the soup. Serve each bowl immediately with a hot flour tortilla on the side. You should have enough broth and ingredients to make 4-6 bowls of soup (depending on how hungry you are). Sprinkle with a dash of seasoned salt, if desired. I LOVE Lourdes’ Chicken soup. I just moved from Escondido and am craving it now that it is getting a little chilly. I can’t wait to try this recipe to satisfy my cravings. I know, it’s addicting isn’t it? I think that’s my favorite chicken soup of all time. Absolutely wonderful recipe! Bon Appetit! I am an Escondido native living in Honolulu. I took my boyfriend to Lourdes 2 years ago when we visited. It was his first time and I told him how it’s a staple for us escondidans! It’s really is thee best soup in town. My friend from Esco(now living in Portland) just posted your recipe a few weeks ago. He said it was delish and pretty darn close to Lourdes! So thanks for this recipe, I am excited to try it! My husband was working in Escondido, tired the soup at Lourdes and brought some home for me. We both really liked it. I made “it” tonight with your recipe, and he loved it~ Yay is right. Glad to hear it. There soup is really good! Hi Leah! Guess what? 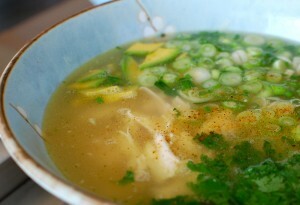 I’m here in Esco and I am totally eating Lourde’s chicken soup right now! I’m jealous! I haven’t been there in ages… and now I’m craving their chicken soup! Thanks for sharing…. I used to live in Escondido from 1974-93 and 2001-04 (I live in Vancouver, WA now so I have not been there in 12 years! ), and I miss Lourdes! I have made my own attempts to copy their soup for my family, and it was always good but I always feel like its not quite like Lourdes! Next time, I will try your technique. I know, isn’t it the best soup EVER when you are sick? I was feeling kind of run down in the last rain storm… so we went to get Lourdes soup and it made me feel so much better!